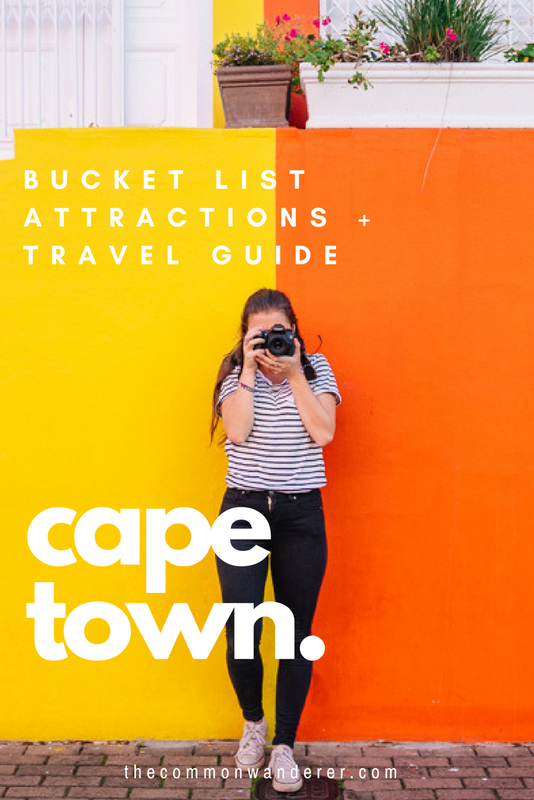 Our Cape Town guide will provide you with all you need to know to enjoy a perfect visit to the Mother City, including our recommendations for things to do, where to stay, where to eat, and other hints and tips. We're Cape Town's biggest advocates. Why? In one day you can swim in the Indian ocean and surf in the Atlantic ocean, hike to the Table Mountain summit, sip wine in the Cape Winelands, visit Mandela’s Robben Island cell, explore the diverse and colourful inner city suburbs, and still have time to watch the sunset before tucking into world class cuisine. The city also ranks as one of the most multicultural in the world; Christian, Muslim, Jewish, Hindu and traditional African beliefs coexist peacefully, and it’s a place where each friendly local you meet has an interesting tale to tell. After spending six weeks living under its seductive charms - and very nearly cancelling the rest of our travel plans to spend the summer there! - we can safely say Cape Town is a city where travel dreams are made. Here's our comprehensive Cape Town guide to help you plan the most perfect visit to the city of your (and our) dreams. It doesn’t matter how many times you’ve flown into Cape Town, the views are guaranteed to take your breath away every single time. The city bowl, cocooned on one side in the rugged folds of Table Mountain, spilling down to the sparkling blue Atlantic Ocean is a captivating sight, and it had us entirely transfixed as our plane circled above. Beautiful, energetic, and with adventure aplenty, the whole city just beckons you to come play. But as you make your final descent into town, there’s also another sight that’s likely to take your breath away again - and unfortunately it’s for all the wrong reasons. Directly under the Cape Town flight path lies a sprawling metropolis of another kind. A messy, tangle of tin shacks and haphazard wiring that seems to stretch on forever, this is the Cape Flats, the enormous and impoverished township community that also calls the city home. Cape Town is a city of extremes, and even as you land in town, the distinction between the ‘haves’ and the ‘have nots’ is very obviously apparent. But to understand why this division exists, it’s really important to have a grasp on South Africa’s history and how it continues to impact the country today. Before European settlement began in 1652, the indigenous Khoisan people inhabited the Western Cape area with their vibrant and rich culture for between 10,000 - 15,000 years. When the Dutch East India Company (VOC) landed on the shores of present-day Cape Town and chose the area as their port colony between Europe and the East, the local population were displaced from their land, bloody skirmishes were common, and the Khoisan people were treated incredibly inhumanely. Not long after their arrival, the VOC also began importing slaves internationally from India, Malaysia, Madagascar, and Ceylon, forming the basis of the population now known as Cape Coloured. Even today, Cape Town's multiculturalism can be traced to this time. Defeated by the British in the battle of Bloubergstrand in 1806, the Dutch colony was ceded to the crown. The Brits abolished the slave trade in 1808, finally emancipating their slaves in 1833. Life returned to relative peace again until 1901, when a bubonic plague outbreak (wrongly blamed on the African community) led the ruling British to enforce racial segregation. At this point, the black community were moved to two locations, the docklands, and Ndabeni, which would later become the Cape Flats. In 1948, the National Party won the general elections and swiftly introduced Apartheid; a system of institutionalised racial segregation and discrimination. Cape Town's multi-racial suburbs were broken down and in 1965 'undesirable' residents (aka, any non-white residents) were moved and their homes demolished (the most noticeable area being the vibrant former creative suburb of District Six). One of the most famous opponents of Apartheid, Nelson Mandela and his African National Congress (ANC) compatriots, were arrested and held on the infamous Robben Island prison. Mandela was released in 1990 and held his first speech as a free man from Cape Town’s City Hall. After international pressure and a series of negotiations, Apartheid was finally abolished in 1991, and the country began healing its multicultural roots. Since then, Cape Town has grown considerably in size and importance. It is now Africa’s third largest economic hub city. It's also hosted major international events; in 2010 it hosted nine games of the Fifa World Cup and in 2014 was the World Design Capital. Check out our post on the top 10 things to do in Cape Town for some inspiration! Flanked by imposing Table Mountain, Cape Town’s attractions are numerous and varied in type and location. Outdoor enthusiasts can get their fix at the many stunning beaches and national parks right on the city's doorstep. Lovers of food and wine don’t have to look far either, as the Mother City has more incredible restaurants and wineries than any city in the world. And, for those who fancy a more robust cultural experience, the city’s multicultural heritage and volatile history is just waiting to be explored. Home to 1,000s of cute penguins. Convinced? If you’re after anything Africa, this is your spot. Quirky antique stores rule the streets here! Up and coming hipster capital of Cape Town. Good coffee, craft beer and street art. Find out what you need to see and do in Woodstock. Learn how the majority of Cape Town’s residents live, and have a braai at Mzoli’s. Read about our experience in Imizamo Yethu, Cape Town's notorious township. 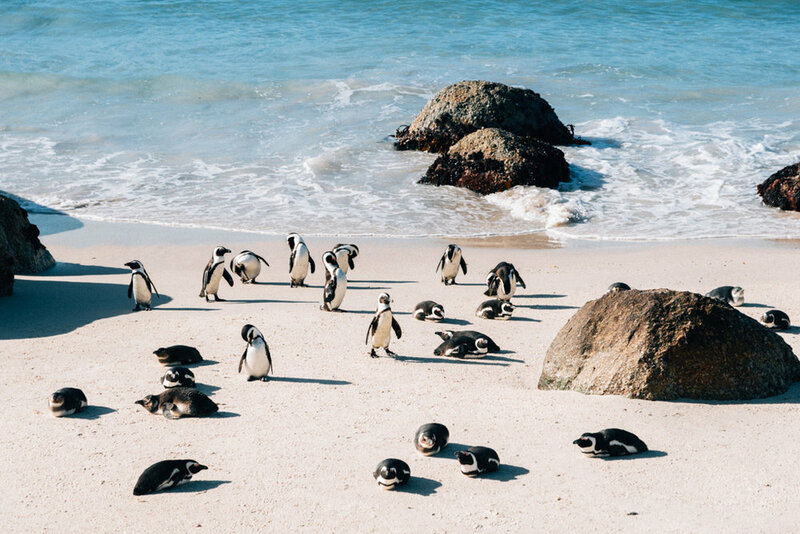 It’s no secret Cape Town comes alive in summer, and it’s not hard to understand why: with its incredible outdoors lifestyle, this is a city made for warm weather. It does, however, become incredibly busy so you need to plan and book ahead for all accommodation, attractions and tours. Although Cape Town can get a little cold, wet and windy in winter, it’s still quite mild and pleasant, meaning those looking to enjoy all the city has to offer without the crowds won’t be too disappointed if visiting from April - August (we even went to the beach in July!). In our opinion, the season you should visit in is spring. Not only are the temperatures very mild, the whole western Cape comes alive with the wildflower season, which is completely unique to this region. Picture the beauty of Cape Town, then add a huge array of colourful wild flowers and you’ll understand why you should visit then! It’s also whale-viewing season, if you’re not already convinced. Whether you’re into lively hostels, delightful guesthouses or absolutely luxury, Cape Town has it all. The CBD is the place to be if you’re planning on staying in a hostel, or hotel, with many lining Long St, the CBD and surrounds. Alternatively, if you want to be closer to the beach, there are many options in SeaPoint, V & A Waterfront and Camps Bay. Accommodation Direct specialises in both private and commercial properties and all over South Africa and is a good choice if looking for guest houses or unique hotels. With over 20,000 listed properties, you’ll be able to find what you’re looking for. If you’re after a specific hotel, click through to Hotel’s Combined and narrow down the options to suit your own needs. The sheer amount and quality of AirBnb properties in Cape Town is incredible. We had a tough time selecting but eventually chose in SeaPoint, which was great a great, vibrant location. Check out Cape Town’s AirBnB listings and use our link when booking to get yourself £25 off your first booking. so getting around the city easily really isn’t a problem. From our personal experience, we highly recommend using Uber as we found the service safe, cheap and abundant. WHAT DO THINGS COST IN CAPE TOWN? Cape Town is one of the most affordable cities we’ve experienced. We were constantly astounded at the cost of various things, including food, alcohol and accommodation. That being said, the Rand has strengthened significantly recently so your dollar/pound/euro won’t go as far, but it’s still very cheap. Safety is a major concern for most tourists to South Africa and rightly so; the crime rates are extremely high. For some context though, most violent crime tends to exist within townships and between gangs. Check out our post on travelling safely in South Africa here. Pickpockets operate in all major cities and tourist attractions, and tourists are seen as easy prey. Take all the normal precautions you would in any major city. Never let your card out of your sight and when entering your PIN, always cover the PIN pad. Never leave valuables in our car... ever. Car break ins are very common. Quite simply, unless you’re on a tour, you shouldn’t be visiting these areas. Period. Walking around after dark in South Africa is not a good idea as it provides a thief with an easy target. Just don’t do it. Catch an Uber instead. All international and domestic flights land at Cape Town international airport, about a 20 minute drive from the city. Emirates, British Airways and South African Airways are the main international carriers connecting Cape Town with the world. Domestic airlines such as Kulula and Mango connect Cape Town with many South African cities and towns. International and interstate buses arrive at the bus terminus next to Cape Town train station, in the heart of the city. Translux For backpackers looking to explore the rest of South Africa, we recommend the Baz Bus. It’s a unique hop-on-hop-off, door-to-door bus service between 180 backpacking hostels in 40 different towns in South Africa, and follows the coast, via the Garden Route to Johannesburg. Have you visited Cape Town? Do you have anything to add to our Cape Town guide?